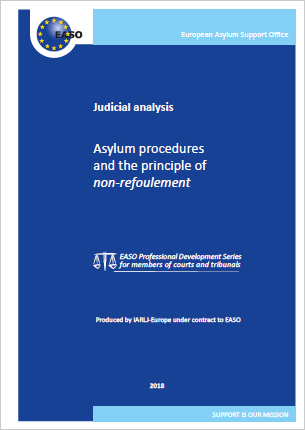 The EU's European Asylum Support Office (EASO) has published a judicial analysis on asylum procedures and the principle of non-refoulement. The analysis is a joint project of EASO and the European chapter of the International Association of Refugee Law Judges (IARLJ) and it forms part of the EASO professional development series for members of courts and tribunals. You can download the 200-page analysis here. A general introduction setting out the legal framework of this judicial analysis (the APD (recast), an overview of the rules of interpretation of the APD (recast), the objective and structure of the analysis and a presentation of the concepts of procedures and non-refoulement. An examination of the general provisions relating to definitions within the APD (recast), its scope and the rules governing how the asylum procedure is initiated. A detailed analysis of the rules governing asylum procedures and appeal against transfer decisions in the framework of the determination of the Member State responsible for examining an application for international protection under the Dublin III regulation No 604/2013. A detailed analysis of the basic principles, safeguards and procedural guarantees for applicants for international protection laid down in the APD (recast), including the right to remain (non-refoulement). A detailed analysis of the rules of the APD (recast) governing the examination of applications for international protection at first instance and the right to an effective remedy. An examination of the scope of the returns directive 2008/115/EC of relevance to asylum procedures. "The analysis is supported by a compilation of jurisprudence and appendices listing not only relevant EU primary and secondary legislation and relevant international treaties of universal and regional scope, but also essential case-law of the Court of Justice of the European Union (CJEU), the European Court of Human Rights (ECtHR) and the courts and tribunals of EU Member States. To ensure that the relevant legislation and case-law is easily and quickly accessible to readers, hyperlinks have been utilised. Other judicial analyses, which have been or are being developed as part of the professional development series, explore other specific areas of the CEAS, in addition to one general introduction to the CEAS. "The aim is to set out clearly and in a user-friendly format the current state of the law. This publication analyses the law as it stood at 20 October 2017. However, the reader will be aware that, at the time of writing, the asylum systems of a number of EU Member States came under exceptional pressure due to the arrivals of unprecedented numbers of persons seeking international protection. It is worth emphasising in this context that, together with other judicial analyses in the professional development series, this judicial analysis will be updated periodically as necessary. However, it will be for readers to check whether there have been any changes in the law. The analysis contains a number of references to sources that will help the reader to do that."